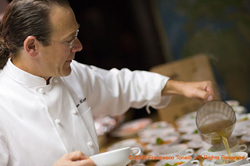 Bruce's more than two decades as a chef, restaurateur, high-end caterer, teacher, brand ambassador/spokesperson and culinary consultant to top wineries have given him a wealth of expertise and broad platform of experience to share. Whether instructing national sales managers in the wine industry on the fundamentals of food and wine pairing; entertaining and teaching attendees at a corporate retreat to trust their palates and experiment with unique flavor combinations, or appearing on national TV to share menu creation and food presentation tips to make at-home entertaining seamless for viewers, Bruce's easy and approachable way of sharing his expertise and skill has made him a popular wine country resource. 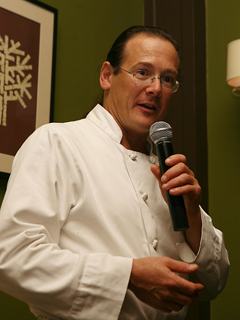 As a culinary consultant and preferred chef for a number of top California wine country properties and labels, Bruce is an expert at creating innovative menus to showcase wines and specialty products. Bruce also consults for specialty food markets. His tailored pairing recipes and menus have appeared in the media and on websites for such wine brands as Gallo of Sonoma, Louis M. Martini, MacMurray Ranch, Sierra Valley, Turning Leaf, Rancho Zabaco, Pont D'Avignon and Red Bicyclette. As a wine country chef with an intimate understanding how food and wine works together, Bruce has taught numerous groups - both industry and trade - how to make food and wine pairing approachable, fun and valuable. His down-to-earth, yet dynamic presentation style has made him a popular choice for companies and consumer groups alike. 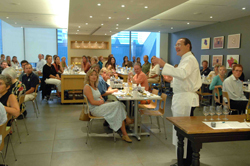 Bruce has conducted media and culinary tours throughout Canada and Asia as a chef, entertaining and food and wine pairing expert on behalf of a number of wine brands, including Turning Leaf and Sierra Valley Wines. His background as a chef, high-end caterer and food and wine pairing expert gives him tremendous cache as a food, lifestyle and entertaining pro. An accomplished and savvy public speaker, Bruce is an excellent brand "messenger" - equally at ease in front of the camera and with live public audiences. For media inquiries, to book Bruce for appearances or inquire about related services, bruce@greatpairings2.com 707-793-9645.